Spider chart shapes like spider, area spider, percentage spider, percentage area spider and polar are available. 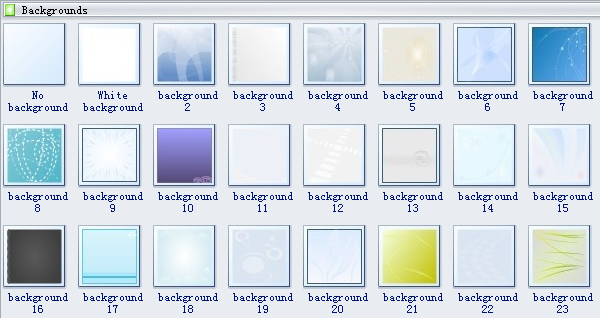 Besides, lots of beautiful backgrounds are provided to make your diagrams look even more attractive. Spider chart gets its name because of its appearance, and it plots the values of each category along a separate axis that starts in the center of the chart and ends on the outer ring. Percentage spider means dividing the spider chart into 100 percentage parts and then allocate the number of percentage parts required for each item. Polar chart displays a series as a set of points that are grouped by category on a 360-degree circle. Values are represented by the length of the point as measured from the center of the circle. In the library of Spider, there is a shape inserted to guide users how to use Spider shapes. It is put on the top left corner of the library window. Drag it onto the drawing page to see relevant information. Click the bottom box to download detailed User Manual. All the Spider Symbols can function as a blank template. You can make modifications according to your need through the floating action button. It shows when the shape is selected or when the pointer is over the shape. Rest the pointer over the button to show what you can do through it. With one single click, the shape alters automatically, eliminating many hassles of hand drawing. Need fresh looking spider chart symbols for your design? These spider chart symbols are a cinch to pop in. And their crisp, fine detail will make spectacular, easy-to-understand diagrams and presentations to your customers. You can get things done quickly by leveraging the spider chart templates. 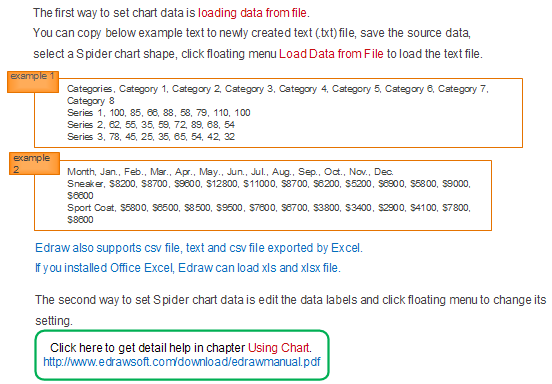 To get detailed help, please go to this link: how to edit spider charts.